Dr. van den Brink, Chief of the Adult Bone Marrow Transplantation Service in the Department of Medicine, is an immunologist and medical oncologist who is an expert in allogeneic (donor provided) blood stem cell transplantation for adult cancer patients. Marcel R. van den Brink has been named to the Alan N. Houghton Chair. 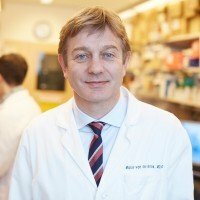 Dr. van den Brink, Chief of the Adult Bone Marrow Transplantation Service in the Department of Medicine, is an immunologist and medical oncologist who is an expert in allogeneic (donor provided) blood stem cell transplantation for adult cancer patients. A physician-scientist, he also heads a laboratory in Sloan Kettering Institute’s Immunology Program and is working to translate the results of his laboratory’s research into new therapies that could potentially improve outcomes for transplant patients. 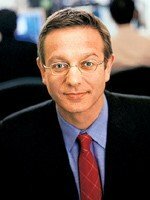 Dr. van den Brink earned his MD and PhD degrees from Leiden University, in the Netherlands. He was a resident at Duke University Medical Center and held a fellowship at Beth Israel Deaconess Medical Center. He joined Memorial Sloan Kettering in 1999. The Alan N. Houghton Chair was established in honor of Dr. Houghton, former Chair of Sloan Kettering Institute’s Immunology Program, who has served at Memorial Sloan Kettering for more than 25 years.